That Vine street shall be a two way street from the dead end nearest to Indiana State Highway 13 to Fifth Street. That Vine street shall be a one way street, south, from Ninth Street to Fifth Street. NOW, BE IT ORDAINED, by the Town Board of Trustees, of the Town of Lapel, Madison County, Indiana. That Vine Street shall be a two-way street from the dead end at Indiana State Highway 13 to Fifth street and a one way street south from Ninth Street to Fifth Street. That Clara Street shall be a one way street northbound from 7th Street to 9th Street. That the intersection of 300 South and County Road 132, shall be designated as a four way stop. That the intersection of 300 South and County Road 132 is hereby designated as a four way stop intersection. That this Ordinance shall become effective on the posting of the four way stop sign after this date. ORDINANCE APPROVING AN INTERLOCAL AGREEMENT FOR THE ESTABLISHMENT AND ADMINISTRATION OF A FIRE PROTECTION TERRITORY BETWEEN STONY CREEK TOWNHIP, MADISON COUNTY, INDIANA, AND THE TOWN OF LAPEL, INDIANA AND FOR THE ESTABLISHMENT OF AN EQUIPMENT REPLACEMENT FUND. WHEREAS, it has been determined that creation of the Lapel Stony Creek Township Fire Protection Territory is in the best interests of the citizens of the Town of Lapel, Indiana and of Stony Creek Township, Madison County, Indiana. The Trustee and Advisory Board of Stony Creek Township, Madison County, Indiana, hereby join together with the Common Council of the Town of Lapel, Madison County, Indiana, under the provisions of Indiana Code 36-8-19 to establish a fire protection territory. The geographic area constituting the fire protection territory shall include all areas within the boundaries of Stony Creek Township, Madison County, Indiana, and the incorporated limits of the Town of Lapel, Indiana. Provider Unit is defined as the Town of Lapel, Madison County, Indiana. Participating Unit is defined as Stony Creek Township, Madison County, Indiana and the Town of Lapel, Indiana. Territory is defined as the fire protection territory established pursuant to this Ordinance. Boundaries shall be defined as that territory included within the Town of Lapel, Indiana incorporated limits and the territorial limits of Stony Creek Township, Madison County, Indiana, all as outlined on Exhibit "A" attached hereto and incorporated by reference herein. Services shall be defined as fire protection and emergency services including the capability for extinguishing all fires that might be reasonably expected because of the type of improvements, personal property and real property within the boundaries of the territory. Fire prevention services including identification and elimination of all potential and actual sources of fire hazard and other purposes and function related to the provisions of other services. The term of this Agreement shall be from July 1st, 2010 through and including June 30th, 2011 and shall automatically renew for successive one (1) year periods until either party passes a resolution or ordinance after January 1st and before April 1st of any calendar year terminating the Agreement effective June 30th of that calendar year, and further subject to additional provisions that are contained in the said Interlocal Agreement executed between the Town and Township, which provides for a mandatory notice to be served three hundred sixy-five (365) days prior to any such termination proceeding. The Town and the Township shall establish the same tax rates as it would apply to the Fire Territory. Both units shall apply their respective tax rate uniformly on their respective taxable property within the territory pursuant to Indiana Code 36-8-19-7. The Township shall annually levy its allowable fire property tax levy and pay over to the provider unit all distributions of that property tax along with all other tax revenue associated with the property tax including financial institutions / bank personal property tax, vehicle excise tax, and commercial vehicle excise tax as shown on County Form #22. Also the Township shall pay over to the provider unit a portion of its annual COIT Certified Shares based on the property taxes levied by the Township for the benefit of the Fire Territory versus the total property taxes levied by the Township Specifically, Township property taxes levied for the benefit of the Fire Territory divided by the total property taxes levied by the Township multiplied by the Township's COIT Certified Shares distribution. The Township shall pay over all the above stated taxes as received by the County. The Town of Lapel, Indiana shall establish a fire protection territory fund which will be used to pay over to the Lapel Stony Creek Township Fire Territory to fund the budget of the said territory which will provide the fire and emergency services of the territory and to those areas which will contract for services from the said territory. The budget for the fire protection territory fund shall be approved by the Fire Board of the Lapel Stony Creek Fire Territory, which budget shall be set in an amount deemed sufficient to meet the expenses of operation and maintenance of the aforementioned services within the territory and to maintain an operating reserve of not greater than twenty percent (20%) as provided by Indiana Code 36-8-19-8(2) after the adoption of said fire protection budget, the participating units shall establish the tax levy required to fund the budget, as estimated by the provider unit, subject only to other applicable property tax levy controls. Pursuant to Indiana Code 36-8-19-8.5, there shall be established an equipment replacement fund to be used to purchase necessary equipment to provide the agreed upon services set forth above and in the Interlocal Agreement between the participating units included but not limited to equipment and housing that will be used for the equipment to serve the entire territory. All other actions authorized to be performed by participating units necessary to carry out the terms of the Interlocal Agreement and services set forth above under the provisions of Indiana Code 36-8-19 are hereby authorized. Upon the adoption of this Ordinance, the participating units agree that same property tax rates shall be imposed on all taxable property in the Town of Lapel, Madison County, and imposed on all taxable property in Stony Creek Township, Madison County, Indiana for the services provided by the fire protection territory. The agreement to establish a fire protection territory shall include the creation of a fire protection fund by the Lapel Stony Creek Township Fire Territory, from which all expenses of operating and maintaining the fire protection services within the territory, including repairs, fees, salaries, depreciation on all depreciable assets, rents, supplies, contingencies, and other expenses lawfully incurred within the territory shall be paid. The funds and money in the fund may be used for any other expense or purpose, including the payment of debt service or lease rentals on obligations issues or entered into to finance buildings or equipment. The budget for the fire protection fund shall be approved by the Lapel Stony Creek Township Fire Territory Board. The budget shall be set in an amount sufficient to meet the expenses of operation and maintenance of fire protection services within the territory and to maintain an operating reserve. After adoption of the fire protection budget, the participating units shall establish the tax levy required to fund the budget, as estimated by the provider unit, subject only to any applicable property tax levy controls. The agreement shall include the establishment of any equipment replacement fund, to be used to purchase fire protection equipment, including housing necessary for the said equipment. The agreement shall also authorize the participating units to do any and all other acts provided under the provisions of Indiana Code 36-8-19. All prior Ordinances or parts thereof that are inconsistent with any provisions of this Ordinance are hereby repealed. A copy of the Agreements attached hereto and made a part thereof. Introduced and filed on the 22nd day of March, 2010 at a special Meeting of said Council. A motion to consider on first reading on the day of introduction was offered and sustained by a vote of 3 in favor and 0 opposed pursuant to Indiana Code 36-5-2-9.8. On the 22nd day of March, 2010, a motion to approve the above on second reading was offered and sustained by a vote of 3 in favor and 0 opposed pursuant to Indiana Code 36-5-2-9.8, following a Motion to suspend the rules of said Council and approve this Motion on the same day as was introduced due to the time considerations of the Indiana Code which provides for the establishment of Fire Territories. Duly ordained and passed this 22nd day of March, 2010 by the Common Council of the Town of Lapel, Indiana, having been passed by a vote of 3 in favor and 0 opposed. PARTIES: The Interlocal Agreement is made by and between the Town of Lapel, Madison County, Indiana and Stony Creek Township, Madison County, Indiana. Territory and Unit Defined. The Participating Units hereby ratify and affirm the establishment of the Territory as a fire protection territory under the provisions of Indiana Code 36-8-19 et seq. The geographic area constituting the Territory shall include all areas within the boundaries of the Town of Lapel, Indiana and of Stony Creek Township, Madison County, Indiana. The Town of Lapel, Indiana and Stony Creek Township are established units of local government. The Territory is illustrated and described in Exhibit A. attached hereto and incorporated by reference herein. Fire protection services including the capability for extinguishing all fires that might reasonably be expected because of the types of improvements, personal property and real property within the boundaries of the Territory. Fire prevention services including identification and elimination of all potential and actual sources of fire hazard. All other purposes and functions related to the provisions of and associated with other emergency services. Uniform Tax Rate. The Town of Lapel, Indiana, and Stony Creek Township, Madison County, Indiana, shall establish a uniform tax rate which both units shall apply uniformly within the included fire territory and which shall apply to all of a units' taxable property within the territory pursuant to Indiana Code 36-8-1-7(2). Pursuant to Indiana Code 36-8-19-8.5, there shall be established an Equipment Replacement Fund by the said territory, to be used to purchase necessary equipment to provide the agreed upon services set forth above and in this Interlocal Agreement between the participating units included but not limited to equipment and including housing of the said equipment that will be used to serve the entire territory. The budget for the Lapel Stony Creek Township Fire Protection Territory shall be approved by the Lapel Stony Creek Township Fire Territory Fire Board, which budget shall be set in an amount deemed sufficient to meet the expenses of operation and maintenance of the aforementioned services within the territory and to maintain an operating reserve of not greater than twenty percent (20%) as provided by Indiana Code 36-8-19-8(c) after the adoption of said fire protection budget, the participating units shall establish the tax levy required to fund the budget, as estimated by the provider unit, subject only to other applicable property tax levy controls. Receive and deposit into the Fund all sums payable to or on behalf of the Territory from the Fund subject to the availability of an approved appropriation therefore. Provide the administration of all employee payroll and benefits related to the Territory, including the administration of group medical benefits, retirement contributions and benefits, worker's compensation coverage and all other employment benefits for employees providing services to the Territory. Maintain a fire department to provide fire protection, services, fire prevention services and other services and functions related to fire protection and fire prevention or emergency services within the Territory or to contract with other governmental or private entities to provide these services within the Territory. Regardless of the designation of the Provider Unit, in accordance with the applicable provisions of Indiana Code 36-8-19 et seq, both the Provider Unit and the Participating Unit hereby agree to establish a Fire Board which will oversee the operation of the Fire Territory so created. This Fire Board can be a separate not-for-profit Indiana corporation wholly owned and operated by the participants to this Interlocal Agreement or the same can be an organizational agreement wherein the two Participating Units will establish By-Laws which will govern the operation of the said Territory Day-To-Day operations as the same applies to the business of providing fire and other emergency services to the geographical unit that comprises the said Fire Territory. The specific provisions of this Fire Board will establish the members of the board of directors of the said Fire Board as well as qualifications for the said Board of Directors as well as other officers and duties of the said officers of the said Fire Board of the Fire Territory. Further, this Fire Territory Fire Board will survive any subsequent governmental changes that would occur by operation of the Indiana Legislature and the power is granted to the Fire Board of the Fire Territory to modify the By-Laws in accordance with the changes that may mandate said changes as well as any other reason for modification of the said By-Laws. Selection, the number of Directors and replacement of the said Directors shall be provided in the By-Laws. To own, acquire and dispose of real and personal property used by and on behalf of the Territory in order to provide for fire protection, fire prevention, and other functions and purposes related thereto within the Territory, subject to the availability of an approved appropriation for any acquisition of real or personal property. The power to enter into contracts and leases for facilities and services related to, contracts with volunteer fire departments for the provision of services within the Territory, all subject to the availability of an approved appropriation to fund such contracts or leases. The power to act as the purchasing agent for items needed for the furtherance of this Agreement. The authority to sue and defend lawsuits resulting from the providing fire and emergency services within the Territory and to invoke any legal, equitable or special remedy for the enforcement of any powers vested by law or delegated by this Agreement to the Lapel Stony Creek Township Fire Territory Fire Board. The authority to accept gifts, donations, grants and subsidies to the Territory for fire protection, fire prevention, fire safety and emergency response purposes. Any such proceeds shall be deposited in the Fund and shall be held and accounted for in the same manner as other Territory funds. Such additional or incidental authority and power as shall be necessary to acomplish the specified powers and authorities delegate herein, or as is otherwise necessary to accomplish the specified purposes of this Agreement. Acquisition of Assets. Subject to the availability of an appropriation duly approved by the Lapel Stony Creek Township Fire Territory Fire Board, The President/Executive of the Lapel Stony Creek Township Fire Territory Board shall be authorized to serve as the purchasing agent for the Territory for the furtherance of the purposes of this Agreement and shall acquire all new assets in the name of the Territory, unless otherwise agreed in writing. All purchases and acquisitions of any equipment goods or materials for the Territory shall be subject to all provisions of Indiana law applicable to public purchasing. Disposition of Assets. The Lapel Stony Creek Township Fire Territory Board is authorized to dispose of assets of the Territory in the ordinary course of the Territory's business provided such disposal is made in accordance with laws applicable to governmental entities. Fire Territory Budget and Finance Matters. Budget Recommendation. All budget recommendations for the annual budget of the Lapel Stony Creek Township Fire Territory shall be submitted to the executive of the said Fire Territory no later than July 1st of each calendar year. The executive of the Fire Territory shall, no later than July 10th of each calendar year, submit to the Participating Units a proposed budget for all operations of the Territory for the forthcoming budget year, which proposed budget shall contain all proposed fees, salaries, rents, supplies, contingencies and all other expenses to be paid from the Fund, as well as all anticipated capital expenditures for fire protection equipment proposed to be expended from the Equipment Fund and any other recommended expenditures. The proposal may contain a proposed reasonable operating balance, not to exceed twenty percent (20%) of budgeted expenses for fire services, as allowed by Indiana Code 26-8-19-8(c). Participating Unit Budget Meeting. No later than July 31st of each year, the Territory budget as approved shall be used to establish a tax levy to be imposed throughout its unit of the Territory in an amount required to fund the budget as approved. Action by Provider Unit. Upon receipt of a proposed budget approved at a budget meeting as provided in Section VII 2., the Territory budget as approved shall be included with the budget for the Provider Unit, and the same shall establish a tax levy to be imposed throughout the Territory of the Provider Unit in an amount required to fund the budget as approved. Equipment Replacement Fund. Recommendation for expenditures from the Equipment Fund may be forwarded to the President/Executive of the Lapel Stony Creek Township Fire Territory. If made in conjunction with the regular budget process, the time frames and procedures set forth in Section VII 2., Section VII 3, and Section VII 4, shall apply. If not made in conjunction with the regular budget process, recommendations for expenditures from the Equipment Fund shall be subject to the same approval process as budget recommendations, on a time frame established by the Provider Unit. Expenditures may be approved for the purchase of equipment for any volunteer department providing services within the said townships. Pursuant to Indiana Code 36-8-19-8(c), if the amount levied in any year for the Fire Protection Territory Fund exceeds the amount necessary to cover expenses of the Territory for that year, such surplus money may be transferred by the Provider Unit to the Equipment Fund in an amount not to exceed five percent (5%) of the levy for the Fire Protection Territory Fund. Indiana Code 36-8-19-8(c). Additional Appropriations. If at any time it is determined that an additional appropriation is necessary over and above the appropriations contained in the Territory's current budget, whether such appropriation is from existing funds or funds to become available from whatever source, such additional appropriation shall be submitted to an appropriate Fire Board meeting. In the event an additional appropriation is approved pursuant to this section, it shall be approved and submitted by the Provider Unit to the Department of Local Government and Finance (DLGF) for certification of available funds and approval when necessary. Incurrence of Debt. A recommendation to incur debt to finance the purchase of fire protection or emergency response equipment or facilities for use by the Territory may be forward to the President/Executive of the Fire Territory for consideration and action at any regular or special meeting of the Fire Territory. A recommendation to incur debt may be made in conjunction with the regular annual budget process or at any other time. Upon receipt of a recommendation to incur indebtedness pursuant to this Section, the Fire Territory shall consider such recommendations at its next regular or special meeting, and shall either approve, modify or reject the recommendations. Authority is hereby given to the Lapel Stony Creek Township Fire Territory Fire Board to incur indebtedness. Before indebtedness may be incurred, the said Fire Territory Fire Board must adopt a Resolution specifying the amount and purpose of the debt, and such indebtedness must be approved by the DLGF in accordance with Indiana Code 6-1.1-18.5 et seq. Upon the final approval of the incurrence of indebtedness by the DLGF, a uniform property tax rate shall be imposed by the said Fire Protection Board throughout the Territory to retire the approved indebtedness in accordance with the provisions of Indiana Code 36-8-19-8 and 36-8-19-9. Duration, Amendment, Withdrawal and Termination. Duration. This Agreement shall continue as the binding agreement of the Participating Units until modified or terminated in accordance with the terms and provisions set forth below. Amendment. The Participating Units may, from time to time, alter, change or amend the terms and conditions of this Agreement by an amendment in writing making specific reference to the document as an amendment to this Agreement, approved and executed by each of the Participating Units in the same manner as this Agreement. Any amendment or modification of this Agreement shall take effect immediately upon the approval of the last of the Participating Units to approve such amendment or modification, or at such other times as is specifically designated in the amendment or modification. Withdrawal. If a Participating Unit elects to withdraw from the Territory, the Participating Unit must adopt an ordinance or resolution providing for its withdrawal after January 1st but before April 1st of the calendar year. An ordinance or resolution to withdraw from the Territory shall take effect on July 1st of the calendar year that the ordinance or resolution is adopted. Notwithstanding the foregoing July 1st effective date, in the event of the withdrawal of a Participating Unit, the Participating Units covenant and agree and they will continue to provide fire protection throughout the Territory on the same terms contained in this Agreement through the end of the calendar year during which the ordinance or resolution to withdraw is adopted. In the event of the withdrawal of a Participating Unit from the Territory, the provisions of Indiana Code 36-8-19-9(c) and 36-8-19-13(b) shall apply, and the Participating Unit intending to withdraw from the Territory shall be required to give at least three hundred sixty-five (365) days written notice forwarded by certified mail to the executive and chairman of the Township board of the other Participating Unit of its intend to consider an ordinance or resolution of withdrawal, and the time, date and place of the meeting at which such ordinance or resolution will be considered. Notice of the meeting shall be published two (2) times by the Participating Unit intending to withdraw in each of two (2) newspapers not less than fourteen (14) days prior to the said meeting. Ordinances or resolutions adopted without the foregoing notice shall be invalid and of no effect. In the event that there is a legislation passed that eliminates either the Advisor Board or the Township Trustee of either of the Participating Units, then in that case the procedures for withdrawal shall inure solely to the representatives that are seated on the Fire Board of the Lapel Stony Creek Township Fire Territory which said representatives are from either of the two original Participating Units. Territory. This Agreement shall terminate if there are not two (2) Participating Units which are parties to this Agreement, with one of such Participating Units designated as the Provider Unit. In the event of termination of this Agreement, the provisions above relating to the disposition of assets shall apply, along with any other laws applicable to such termination. Subject to Applicable Law. This Agreement, and the respective rights and responsibilities of the Participating Units shall be subject to the laws applicable to this Agreement and to the delivery of fire protection and emergency response services. The respective rights and responsibilities of the foregoing entities shall be supplemented by any such applicable laws, and to the fullest extend possible, the terms of this Agreement shall be given their full force and effect. The laws of the State of Indiana shall govern the interpretation, validity and performance of this agreement. Severability. If any provision of this Agreement shall be held to be invalid or unenforceable by any court of competent jurisdiction, such provision shall be severed from the remainder of this Agreement and the validity and enforceability of the remaining provisions of the Agreement shall not be affected thereby. Approval and Effective Date. This Agreement shall be approved upon the adoption by the fiscal body of each Participating Unit of any appropriate resolution approving and ratifying this Agreement. After approval and execution by the appropriate officers of each Participating Unit this Agreement shall be recorded with the Madison County Recorder, and the date of recordation shall be the effective date of this Agreement. Within sixty (60) days of the effective date, this Agreement shall be recorded with the Indiana State Boar dof Accounts for audit purposes pursuant to Indiana Code 36-1-7-6. Counterparts. This Agreement may be executed in multiple counterparts, each of which shall be an original and all of which shall constitute one and the same instrument. Shared Documents. The participating units agree to share all documents and records subject to public disclosure requirements of the State of Indiana, upon written request from any participating entity of this agreement. IN WITNESS WHEREOF, the parties hereto have caused this Agreement to be executed in several counterparts in their respective Participating Unit's name by the duly authorized signatories below. A permit shall be obtained before beginning construction, alteration or repair of any building or structure in which the cost of such construction, alteration or repair exceeds Five Hundred Dollars ($500). Permits shall be obtained using forms furnished by the Town of Lapel, and all fees required by this code shall be paid to the Clerk-Treasurer of the Town of Lapel, Indiana. All construction done by the Town is required to follow the procedures and obtain appropriate permits, but at no cost for the fee. Amendments to a recorded plat - Fees are required in accordance with the classifications in item E above, for the area affected, as determined by the Plan Commission. Additional fees will be charged for additional reviews beyond the first 2 reviews when the applicant does not make the revisions requested in the original review. Each review after the initial 2 reviews will be charged in accordance with the schedule and classifications above. Improvement location permits $.15 per square foot of lot area but not less than $500. Out building/unattached garage (over 200 sq ft) - $35 - 3 month expiration with a $300 fine per 30 days after expiration for failure to comply. All other structures - $50 - 3 month expiration with a $300 fine per 30 days after expiration for failure to comply. Signs - $25 per sign plus $1 per square foot over 16 square feet. Any person or persons, firm or corporation who shall initiate construction prior to obtaining a permit of any type set forth in this section shall pay double the fee amount in the schedule. All fees shall be payable to the Town of Lapel at the office of the Clerk/Treasurer and shall be deposited according to the procedures established by the Town Council of Lapel, Indiana. WHEREAS, the Town Board of Lapel, as the Board of Trustees, finds the Petition in proper order and that the property sought to be annexed, by Martha A. Anderson, is adjacent and contiguous to the corporate boundaries of the municipal corporation of the Town of Lapel and that the Petition and all things comply with the above-referenced Indiana Code. Section 1. That the following described real estate owned by Martha A. Anderson is adjacent and contiguous to the corporate limits of the Town of Lapel, Madison County, Indiana. Tract I - Beginning at a point being 14 feet East and 397.89 feet South of the Northeast corner of Lot 143 in William Woodward's Fourth Addition to the Town of Lapel, Indiana, said point also being on the East line of a 14 - foot alley in said addition, and running thence East 328.67 feet to a point being 696.83 feet South of the extended South line of Fifth Street in said addition, and 40 rods West of the East line of the West Half of the Southwest Quarter of Section 27, Township 19 North, Range 6 East, then South parallel with said East line to a point being 169.27 feet North of the centerline of State Road No. 132 (Fishersburg and Pendleton Road), thence turn an angle to the right 90 degrees, and measure 100 feet, thence turn an angle to the left, 90 degrees, and measure South 91.65 feet to said centerline, then Northwesterly along said centerline to the said East line of said alley extended South, thence North to the Place of Beginning. Being a part of the West Hal of the Southwest Quarter of Section 27, Township 27 North, Range 6 East and containing 3.7 Acres, more or less. Tract II - Beginning at a point in the centerline of the Fishersburg and Pendleton Road (Now State Road 132) which is 40 rods West of the East line of the West Half of the Southwest Quarter of Section 27, Township 19 North, Range 6 East, said point also being 435.22 feet measured Southeasterly along the centerline of said State Road 132 from the intersection of the East line of Lot 152, Woodward Fourth Addition to Lapel extended South and the centerline of State Road 132; thence North 169.27 feet; thence deflect an angle to the left of 90 degrees 00 minutes West 100.00 feet; thence deflect an angle to the left of 90 degrees 00 minutes and measure South 91.65 feet to a point in the centerline of State Road 132; thence Southeasterly along said centerline 126.59 feet to the Place of Beginning. Being a part of the West Hal of the Southwest Quarter of Section 27, Township 27 North, Range 6 East and containing 0.3 of an Acre, more or less. That the Town of Lapel does not object to any benefit from the above-referenced statute or in the above-referenced Indiana Code section if there is such benefit for the Petitioner. That Paul Fort, Jr. and Patsy A. Fort, are requesting the combining of Lots Numbered 53 and 54 in E.V. Cascadden's First Addition to the Town of Lapel, Indiana as recorded in the Madison County Plat Book 6, Page 4 in the Office of the Recorder of Madison County. Beginning at an existing iron pipe marking the Southeast corner of Lot 54 in E.V. Cascadden's First Addition to the Town of Lapel, Indiana, the plat of which is recorded in Plat Book 6, Page 4 in the Office of the Recorder of Madison County, Indiana, thence South 89 degrees 54 minutes 14 seconds West (assumed bearing) along the South line of said Lots a distance of 100.00 feet to a point marking the Southwest corner of Lot 53 in said Addition; thence North 00 degree 00 minute 00 second along the West line of said Lot 53 a distance of 118.81 feet to a point marking the Northwest corner of said Lot 53; thence North 75 degrees 40 minutes 12 seconds East along the North line of said Lots 53 and 54; thence South 00 degree 00 minute 00 second along the East line of said Lot 54 feet a distance of 144.19 feet to the point of beginning. AN ORDINANCE ESTABLISHING A REVISED SCHEDULE OF RATES AND CHARGES FOR THE USE AND SERVICES RENDERED BY THE LAPEL MUNICIPAL WATER UTILITY. WHEREAS, in connection with the improvements and upgrading and operation of the water utility, the Town has caused a financial rate study to be conducted by Patrick Callahan, C.P.A Based on the results of the study, the Town Council now determines that the rates and charges for the use and services of the water utility should be revised to provide sufficient income to maintain the water utility in a sound physical and financial condition to render adequate and sufficient services to the residents of the Town of Lapel. The revised rates and charges should allow a reasonable rate of return on the water utility plant and improvements and allow a sufficient amount to compensate the Town for providing such adequate service to its residents. WHEREAS, the Town Council now determines that proper notice has been given that the Public Hearing on the proposed revised schedule rates was conducted, by the Town of Lapel, Lapel Town Board, on the 3rd day of June, 2010, at the Lapel Town Board regularly scheduled and posted meeting in the Town of Lapel, Madison County, Indiana. That Public Meeting being properly advertised pursuant to Indiana Code. 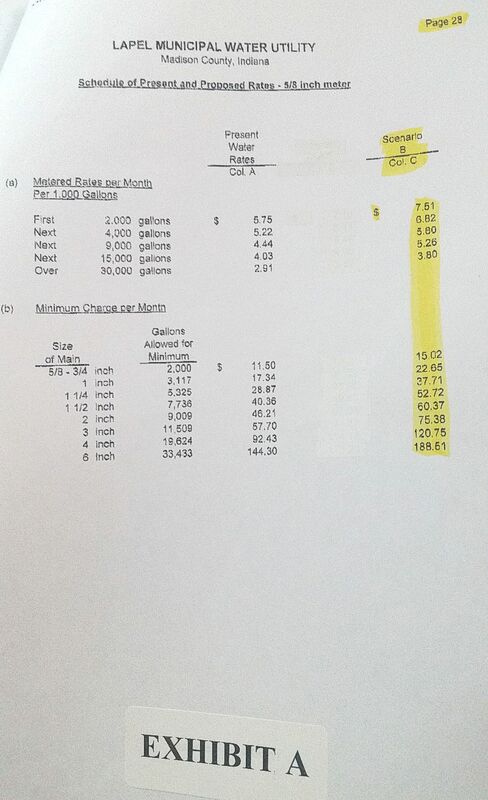 That previous ordinances are hereby amended as to the current water utility rate. That the revised rate in this Ordinance shall go into effect in the first full billing period after the adoption of this Ordinance. That this Ordinance shall be in full force and effect from and after its passage and adoption except as amended or revised. PASSED AND ADOPTED BY THE TOWN COUNCIL OF THE TOWN OF LAPEL ON THE 17th DAY OF JUNE 2010. WHEREAS, the public hearing was held before this Council on October 13th, 2011, at which time testimony from interested persons was received, after introduction of this ordinance and as provided for in the Act. SECTION 1. The Council hereby finds and determines that based upon the Rate Report, the existing rates and charges are insufficient to pay all the legal and other necessary expenses incident to the operation of the utility, including maintenance costs, operating charges, upkeep, repairs, depreciation, including increases in such costs, and the payment of principal and interest on bonds, future bonds or other obligations. SECTION 2. The Council finds and determines that the proposed rates and charges as set forth in the Rate Report are nondiscriminatory, reasonable and just, and therefore should be adopted. SECTION 3. The Council finds and determines that the proposed rates set forth in Exhibit A hereto are nondiscriminatory, reasonable and just, and should be adopted. SECTION 4. All ordinances and parts of ordinances in conflict herewith are hereby repealed. SECTION 5. This ordinance shall be in full force and effect from and after its passage. This ordinance shall be effective for bills rendered on and after the day after adoption of this ordinance or such later date as set forth in Exhibit A. hereto. ALL OF WHICH IS PASSED AND ADOPTED THIS 25th DAY OF OCTOBER 2011, BY THE TOWN COUNCIL OF THE TOWN OF LAPEL, MADISON COUNTRY, INDIANA. Commencing at the Southeast Corner of the West Half of the Southwest Quarter of Section 27, Township 19 North, Range 6 East; thence North 00 Degrees 33 Minutes 23 Seconds East 1820.63 feet along the East Line of said West Half to the Point of Beginning and to a Capped Rebar Set; thence North 89 Degrees 25 Minutes 12 Seconds West 991.56 feet to a Capped Rebar Set, which point is on the East Right of Way of the Wm Woodward 5th Addition to the Town of Lapel, the plat of which is recorded Plat Book 5 Page 77 in the Office of the Recorder of Madison County, Indiana; thence North 00 Degrees 32 Minutes 24 Seconds East 911.04 feet along said East Line to a Capped Rebar Set; thence South 89 Degrees 49 Minutes 35 Seconds East 991.95 feet to the East Line of the West Half of the Northwest Quarter of said Section to a Capped Rebar Set; thence South 00 Degrees 38 Minutes 27 Seconds West 75.60 feet along said East Line to a point on the North Line of the Southwest Quarter; thence South 00 Degrees 33 Minutes 23 Seconds West 842.48 feet along the said East Line of said West Half of said Southwest Quarter to the Point of Beginning and containing 20.822 Acres more or less. That the above approved final plat of Lots 1 and 2 of the Wm Woodward 6th Addition shall continue its existing zoning as residential where the current improvements are located. The remainder of the Wm Woodward 6th Addition final plat lots 1 and 2 shall be zoned as agricultural, subject to future requests to the Town of Lapel for zoning reclassification. 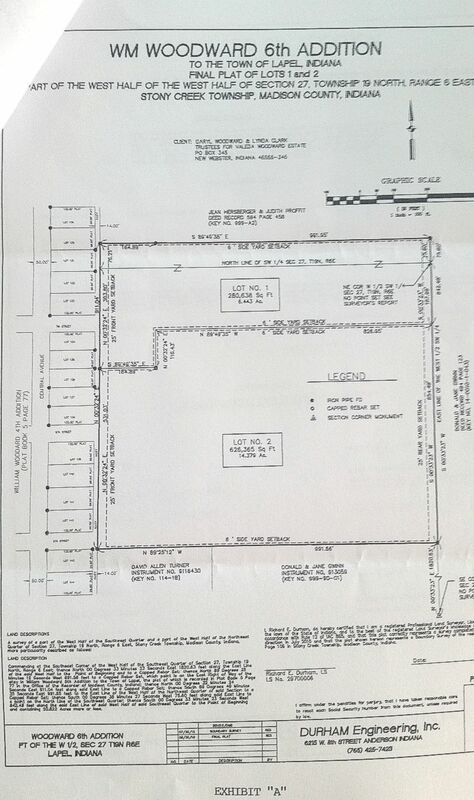 Be it ordained that the Town Board of Lapel now approves the Wm Woodward 6th Addition, final plat of Lots 1 and 2, which final plat is attached to and made a part of this Ordinance referencing the above-described real estate as Exhibit "A". Read and Adopted this 7th Day of October 2010. Passed and adopted by the Lapel Town Council this 16th day of December 2010. All full-time employees are entitled to eight (8) personal days per calendar year. Bereavement days three (3) per family member, which includes and is limited to the following; wife, husband, children, stepchildren, father, mother, stepfather, stepmother, father-in-law, mother-in-law, brothers, sisters; one day (1) for brother-in-law, sister-in-law and (2) for grandparents. All new employees will be under a probationary period for the first six months of their employment, starting with the first day on the job. During this probationary period the employee will not be entitled to paid vacation benefits or sick leave benefits. After six (6) months on the job the employee will receive two (2) paid vacation days for the remainder of the first year of service. All eligible employees will receive eight (8) paid Personal days per calendar year. Accumulated Sick days (those earned prior to January 1st, 2009) are designed and intended to be used for the employee's illness or medical appointments. Absences may be subject to investigation. A physician's statement of "fitness of duty" will be required if an employee is off work for 3 consecutive days or more. The Town also reserves the right to request a "fitness of duty" statement at any time. Accumulated Sick days, if not used, can be carried over to future years. Accumulated Sick days will not be paid upon termination of employment. Personal days, if not used, can be accumulated up to 30 days. At the accumulation of 30 days, this accrual will be capped. Time worked reports must be submitted weekly to the Town Hall for all employees that are eligible for either Personal Days, Paid Legal Holidays, Insurance, Paid Vacation, or Accumulated Sick Leave. One year of employment, one week paid vacation. Two thru four years of employment, two weeks of vacation. Five thru nine years of employment, three weeks of vacation. Ten or more, four weeks of vacation. Following the first year of employment additional weeks will be earned on a calendar year basis beginning January 1st. All vacations are mandatory (cannot work and collect play plus vacation). Vacations must be scheduled one (1) week in advance with a supervisor. Vacations cannot be held over until the next year. Unused vacation days will be paid upon termination of employment. Vacation days must be used before unpaid days off are granted. Overtime is defined for all full-time employees, except Police Officers, as the hours worked, on a daily basis, over 8 hours. Overtime hours will be paid at 1 1/2 their hourly pay. The payroll clerk will prepare on a weekly basis, a report to the Council illustrating the amount of and who were paid overtime. it will be the job of the department supervisors to limit overtime whenever possible. Non-council members, that are authorized members of the Planning Commission, Park Board and Board of Zoning Appeals will be paid $10 per meeting attended. Disbursement of amounts owed will be semi-annually July and January. Town Hall office hours are Monday-Friday, 8:00am to 5:00pm. The Utility/Street Department hours are 7:00am to 3:30pm. On disconnect day, one utility employee will work from 10:00am to 6:00pm so that paid disconnected services can be returned to service. The work week consists of seven (7) days from Saturday and ending Friday. If a Police Officer works more than 40 hours per week, overtime will be paid. Holiday pay is calculated by annual salary divided by 260 days divided by 8 hours=holiday pay. Overtime hours x 1 x hourly pay=overtime pay. Overtime must be approved by the Town Marshall and the Town Council. The salary of a Lapel Police Officer, without academy certification is $30,000 per year. The salary of a Lapel Police Officer with less than two (2) years of experience, with an academy certification is $33,000 per year. If a Lapel Police Officer is sent to the Police Academy, and compensated by the Town of Lapel, the Police Officer is required to remain on the department for two (2) years after graduation from the Academy. If for some foreseen or unforeseen reason the officer has to leave the department or fails to complete the academy assignment, said officer must repay all training compensation of the Town of Lapel. Non-academy graduates will be in a probationary status until one year from graduation date. Academy graduates will be on a probationary period of one year from hire date. New hire without academy certification will be sent to the academy within one year of hire date. It is the desire of the Town of Lapel that all employees gain more education in their specific disciplines. If the employee quits a course, paid by the Town of Lapel, the employee must repay to the town the cost of the course. This would include tuition fees, cost of books and materials, and mileage reimbursements. If the employee completes the course work and attendance requirements, but fails the final test, reimbursement is not required. Retesting is at the discretion of the Council. The Town of Lapel will pay 100% of the employee's health insurance premium, employees will have to pay dependent coverage, if desired. This benefit is available to full-time employees only. Employees who are eligible to enroll in the group medical program may choose to waive participation in the plan. Only employees covered under another group health plan will be permitted to waive coverage. Employees are required to complete the appropriate form to waive their election and provide verification of coverage. An optional dental insurance benefit plan is offered to all full-time employees. The premium for the insurance policy is split 50%-50% between the employee and the employer. When a Lapel Utility employee acquires a Class 1 operators certification for water or wastewater, their salary will be increased 25 cents per hour. If a Lapel Utility employee receives an initial gas operator's certification, their salary will be increased 75 cents per hour.